HaAretz newspaper issue from November 30, 1947 reporting the UN decision in favor of the establishment of a Jewish state. Headline: "The Establishment Of A Jewish State Has Been Decided 33 Of The United Nations Voted In Favor Of The Partition, 13 Were Against, 10 Abstained And 1 Was Absent." 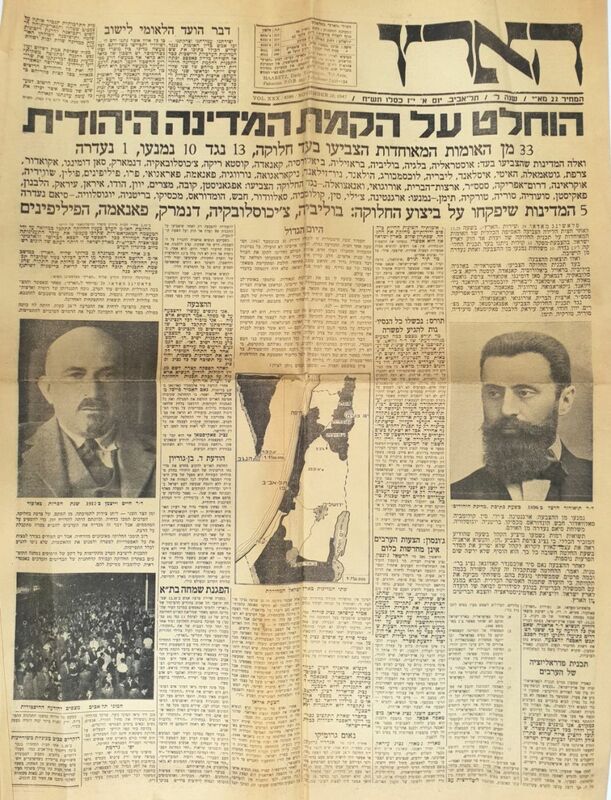 Front page pictures included Herzl, Chaim Weitzmann and a map of the partition plan. Newspaper articles deal with the UN decision, the circumstances which brought about the decision, and its consequences. leaves. 57 cm. Stains. Fold marks, fine condition.